The creation of patchwork quilt designs began with the first settlers and continued as the country expanded in the 1800. 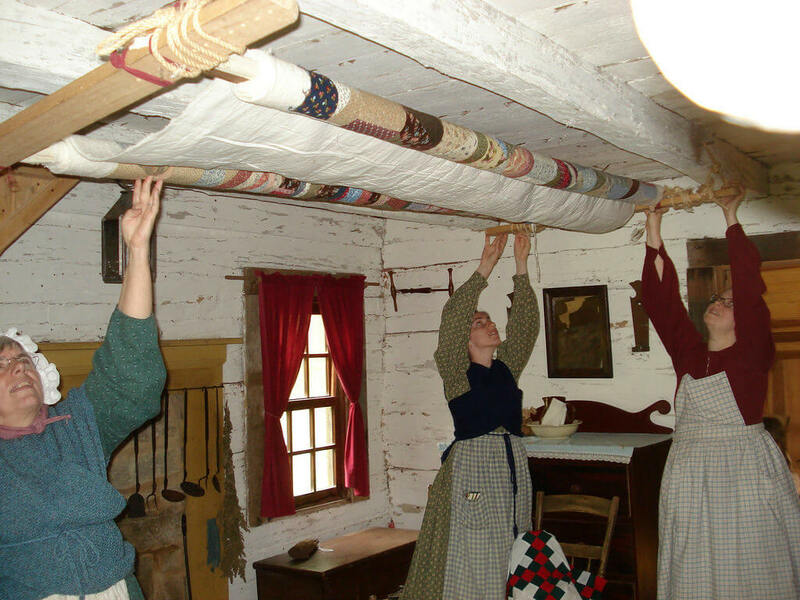 As pioneer families moved westward away from cities it became necessary for women to reuse and repurpose materials. 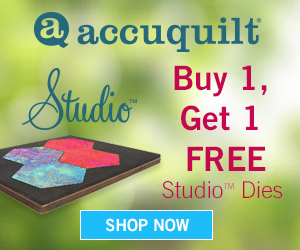 Over time, their ingenuity developed into an increasingly distinct American expression where pieced quilts are typically constructed with a repeated geometric pattern in a series of blocks. 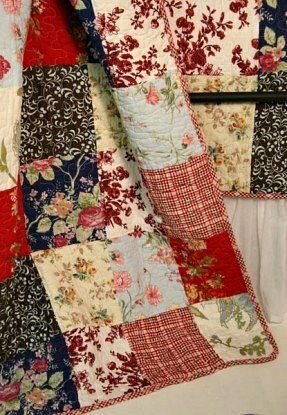 Patchwork quilts are those quilt tops whose design is composed of separate elements sewn together (pieced). Either new fabric or carefully saved scraps are cut into pieces and sewn together to form designs. The pieces, or patches, are usually simple geometric shapes: squares, triangles, rectangles, diamonds, hexagons, and circles. The pieces must be precisely cut and sewn together in order for the edges to fit together exactly. Small pieces are typically joined together into easily handled blocks that are then sewn into strips. The strips are joined to form the completed quilt top. Sometimes a border is added. The block-style patchwork design was the result of a functional approach to the solution of several problems faced by colonial and pioneer quilters. 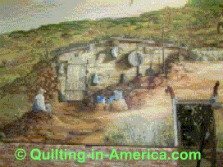 Bed-covers had to made, and in quantity -- drafty houses and dugout houses carved into the sod of the prairie required many quilts to provide warmth during the bitter cold winters. Money was scarce, and whole cloth was expensive. So, from seemingly worthless scraps of cloth, some as small as 1 inch, salvaged from clothes-making and worn out cloth articles, pioneer women pieced together usable pieces of fabric that became one side of the quilt. The block-style technique in which pieces are cut into geometric, straight-edged forms was itself the most efficient method, in terms of both time and material, for using surplus fabric and joining it together. Backs of patchwork quilts were frequently pieced, too. The block-style method was also a time-saving device in which individual, identical blocks can be pieced one by one and later joined together. 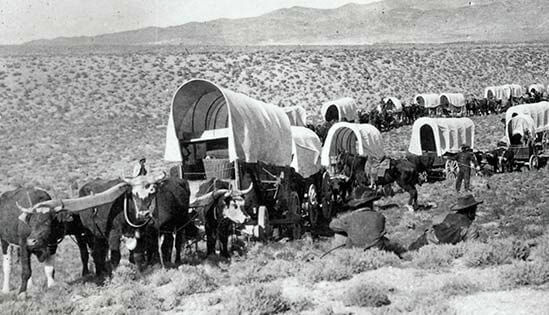 It's also space-saving, which was critical considering the cramped quarters of early American rural living. 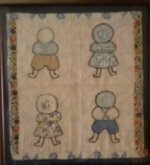 Additionally, a patchwork quilt was often a record of a family’s history, incorporating bits of garments and other household textiles. There are two categories of block-style patchwork. 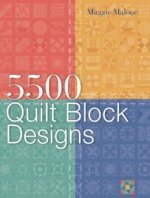 Quilts in which the blocks can each stand alone in terms of the design, and quilts in which the blocks have been joined together as integral parts of the overall design. Quilters developed a multitude of patchwork patterns that, because of their great popularity, became part of the folk tradition. These patterns have colorful names that often reflect elements of everyday life, such as, Log Cabin, Flying Geese, Drunkard’s Path, Lone Star, Bear’s Paw, Broken Dishes, and Windmill.